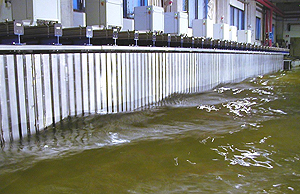 3D wave facility with active wave absorption by the wave board. Current circulation, wind loading and optional secondary uni-directional wave generation. DHI's Shallow Water Basin for combined waves and current is 35 m long and 25 m wide with an overall depth of 0.8 m. The basin is ideal for model testing when the effects of combined waves and current are of major importance, for instance scour around structures, and loads on fixed or floating coastal and offshore structures. 3D wave generation with a new multi-directional segmented wavemaker. With a paddle height of 1.20m, the wavemaker is designed to operate at water depths between 0.2m and 0.8m. Figure 2: 3D wavemaker equipped with DHI AWACS Active Wave Absorption. The wavemaker is equipped with DHI AWACS Active Wave Absorption which is a means of avoiding spurious reflection from a wavemaker. 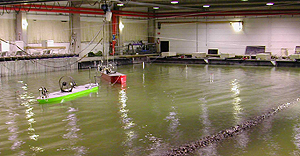 The technique allows for full control over the incident waves, even when testing highly reflective structures in a basin. Furthermore, DHI?s Shallow Water Basin provides the option of secondary uni-directional wave generation by movable piston type wavemakers. Current is generated by external recirculation of water. The additional moveable wavemakers provide the option of collinear wave-current generation by having the water injected underneath the wavemakers. Wind loading on vessels or structures can be simulated by computer-controlled wind fans.